If you're still not paying attention to Oculus VR and the Rift headset -- the folks at the forefront of virtual reality's recent rebirth -- what are you doing? Okay, we'll forgive you. It's still just a development kit after all, and even the latest prototype ("Crystal Cove") is far from the expected final product. Today though, you've got one less excuse to stay in the dark: The second Oculus Rift development kit is available for pre-order; it costs $350; and it's really, really impressive. That's two reallys. The Oculus Rift has come a long way since we first saw it back in 2012. First there was the HD version, and the next big leap came with the Crystal Cove prototype (which took home our Best of CES 2014 award). The second development kit takes Crystal Cove and adds several bells and whistles, most notably a custom, in-house camera that faces you while playing to track depth. The IR sensors are now hidden below the front plastic, and a duo of ports (USB 2.0 and a one-eighth-inch audio jack) is just above where your left eye would be if it weren't covered by a VR headset. The audio jack is self explanatory, but the USB enables attachments (think: Leap Motion etc.). Interesting! A power button is on the right side, which is an important change as it also means that the intermediary box between the previous dev kit and the PC powering it is gone. A single wire exits the second Oculus Rift dev kit, which splits to USB for power and HDMI for video. It's not quite the wireless standalone unit we're waiting for, but cutting down on the mess of wires sure doesn't hurt. So, what's it like to use it? We'd love to tell you it's another staggering jump from Crystal Cove, but that's just not the truth. It's more polished than Crystal Cove in terms of finish, but the performance leap isn't dramatic. The few games we tried -- updated versions of the Tuscany and Unreal Engine 4 RTS demos were on-hand, as well as a new UE4 game with little sword-fighting characters in a multiplayer scenario -- were fun, but the muddy graphics in the former two demos really stood out with the new screen (a low-persistence OLED pushing 1,080 x 960 in each eye). 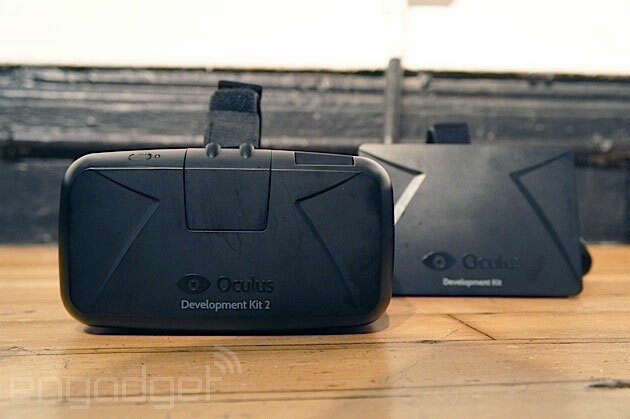 "DK2," as Oculus calls it, is simply the next step in the process, and that's fine. Game developers (and gobs of enthusiasts, ourselves included) get updated hardware for the projects they're working on and Oculus VR gets another injection of cash on its road to the consumer version. Here's the part where we tell you the same thing we've been telling you about the consumer version since 2012. Sadly, it still isn't arriving any time soon. Company founder Palmer Luckey wouldn't put a date on its release or give its target specs, but he did say it'll be another great leap over the second development kit. 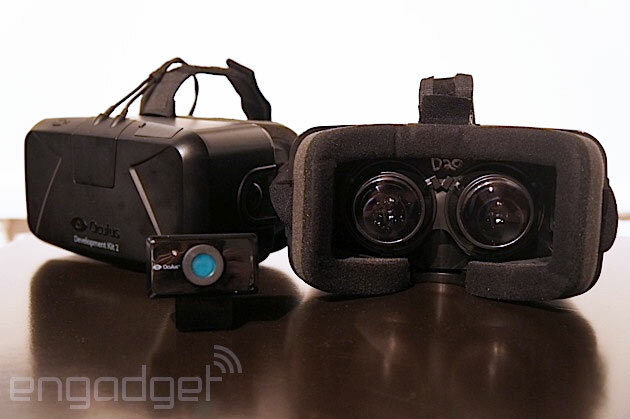 For now, there's another Oculus Rift dev kit that's immersive, surreal and industry-changing. Things could be worse, right? Photos and video: Michael Gorman, Edgar Alvarez and Sean Buckley. Vote on our poll for Would you rather? !